This is one of my winter staples, especially if I’m having a busy week, have no one to impress and don’t want to use a million dishes (big ups to the disherwasherless!) You get your beans, greens and grains all in one pot; in this case I use white beans, kale and quinoa. You also get about 8 servings out of it so you can either freeze it or keep it in the fridge for 4 days or so, having it for lunch or dinner or… stew for breakfast? Why not! It’s really versatile so make up your own spice blend, use different beans and grains (although cooking time may vary for the grain) and, you know, just do whatever you want, this stew is your canvas. Prep the herb blend before proceeding with the recipe, that way you just dump everything in at the same time without much fuss. Preheat a 4 quart soup pot over medium high heat. Saute leeks and garlic in oil with salt for about 3 minutes, or however long it takes you to prep your carrot and parsnip. Add carrot and parsnip, along with the herb blend, turn heat up to high and saute for a few seconds. When you serve you may want to add a little lemon juice or a splash of balsamic vinegar or hot sauce – whatever your thing is. Or you may not. what is the fennel crushing tip? Also I guess once you’ve crushed them you just add them with the dried herbs? I crush fennel the same way I crush coriander–use a garlic press. Put the fennel in the press, crush it down a few times, works great! I too want to know the fennel crushing tip! I despise cleaning garlic presses so I don’t have one do do it Libbie’s way. I used a mortar and pestle to crush it. This recipe is the bomb diggity. LOVE THIS. Even my very meat loving husband said several times how much he liked it. I might add mushrooms next time to bring it up another notch. Also we needed more stock. Thanks for this great recipe! The boyfriend’s not a huge fennel fan, so we made it fennelless, but it was deliiiiiiiish, especially on a rainy day. I have some frozen kale..do you think it would work well as a substitute in this recipe? Yesssss…new recipes on the ppk! I made this tonight and am eating a big bowl with sriracha as I type, so good! African Pineapple Kale Peanut Stew « the taste space – steam, bake, boil, shake! I made this tonight and it was delicious ! roommate and boyfriend approved. My local grocery store was out of white beans so I used romano, still tasted great. Also switched up the spice blend to what I had lying around. Holy crap, I made literally almost exactly the same thing about a month ago without ever having seen this recipe. right down to the leeks and parsnips, a kale white bean quinoa stew. it’s a delicious fall concoction, that’s for sure. I made this! Super delicious yummy times! Wow~ It looked kinda ordinary on paper, but taste amazing!!! Plus, it’s enough to last for a few days. Very nutritious, tasty – it’s got it all~ I used Japanese yams instead of potatoes. I love this recipe- thank you for sharing! Especially that is it a blank slate and let me be a bit of an artist in the kitchen. I used it to clean out my pantry so I substituted orzo instead of quinoa, canned carrots instead of fresh, onion for leeks, garbanzo as my bean and a russet potato instead of yukon gold. All but the potato worked out and made for a great treat after work! Off to bring the leftovers to a friend.. thanks again! I made this stew last night and it was DELICIOUS!! I didn’t have any Yukon Gold potatoes, so I used Russet instead. It probably changed the flavor slightly, but not enough for me to dislike it. I also subbed spinach in for the kale because I didn’t have any. Wonderful flavor, very versatile. I can’t wait to start playing with this recipe and coming up with my own concoction. Wonderful recipe. I’m so excited to have this for lunch all week. I’m not very good at following directions, so I added cumin and turmeric for added kick and corn for some extra veg. I just discovered your site. It’s fantastic! It’s my new daily fave. This was completely and totally awesome. I added the juice of 1/2 a lemon at the end… even my husband– who hates “stews” LOVED it. Kudos and thanks! Hi, I discover your sitr from natural awakenings . I am to try the recipe. I keep you posted. My husband and I love this soup!! it is a wonderful recipe and added to our faveorite’s list. One bowl fills you right up! This turned out super yummy and it looked really pretty in the bowl to boot! Super flavorful! Thank you for this recipe. It was delicious! I would definitely recommend the addition of lemon juice and some fresh parsley before serving. Has anyone tried this in a slow-cooker? Good or bad idea? ive made this a couple of times..it truly is delicious. swapped ingredients about a little today. same herb blend, sweet potato, white cabbage, onions,potatoes, chickpeas and then the kale. a splash of balsamic vinegar and soya sauce at the end perfected it. Just made this today and I love it. The herb blend is terrific. I used water and two cubes of vegan bouillon (Rapunzel brand) instead of the veg broth, and needed to add 2 cups of water toward the end so there would be enough liquid to cook the kale. Even with the extra water, this turned out so, so flavorful and delicious. I’m going to take some to share with my omnivore parents tomorrow. I made this a couple months back but just pulled some leftovers out of the freezer and oh man…. so good! It was great because I had never used parsnip before. I think the herbs really make this soup though. You don’t need to use vegetable broth (kind of redundant anyway). I used a fennel bulb instead of fennel seeds but next time I’ll try it your way. Thanks! I just bought this book, and as expected, Isa has, once again, outdone herself. I have always thought I was a good cook…and I am, but Isa is a FABULOUS cook!!! Thanks for the recipes and keep on cookin’……..
ISA – what brand of vegetable broth did/do you use? This may be the next soup that I’ll have to try. My husband and I absolutely loooove Veganomicon’s Baked Potato and Greens soup; it will be a regular meal in our household, especially as the weather gets cooler. This one sounds just as yummy. I modified this to make it in my slow cooker. (left out the olive oil.) Also didn’t have any fennel, so omitted that. I had red quinoa, so that should be interesting. It will cook all day. I can’t wait to try it. Since this is the VeganMoFo, I’m going to veganize the Irish Soda Bread recipe from Recipes for a Small Planet & have that with it. just made this…came out great! things i changed- i added a zucchini, and used herbs de provence….which is basically the same thing as isa’s herb mixture….instead of 8 c. veg broth i used ten cups of filtered water, and added yellow miso paste…i used whole wheat orzo instead of quinoa and butter beans (baby limas) instead of white beans. its really chunky, even with the extra water, but good good good!! Why isn’t there a handy link to e-mail this to myself and family??? I didn’t change a thing in this recipe, and it was amazing. My whole family loved it. I’ll be making this again for sure, we just made the switch over to vegan food last week and this is definitely one of our favorite recipes. Vegan or not, this is genuinely good food. 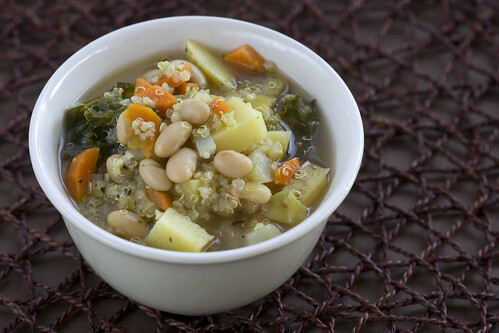 White Bean, Quinoa And Kale Stew with Fennel « the taste space – steam, bake, boil, shake! The only thing I added was mushrooms (when I added the potatoes and quinoa)…….amazing! Squeezing lemon juice over your bowl at the end is a must! It was the first time I had parsnip or kale…. Very hearty, soothing and comforting….it will be my ‘go-to’ stew from now on. Thank you! Guest Blogger: In Her Grace « Vegan Bloggers Unite! made this, its delicious comfort food that doesnt leave you feeling too full afterwards! a really versatile recipe, i substituted parsnip for cauliflower and was delicious, will definitly make this again! We just made a huge double batch of this for dinner and it is truly amazing. As someone who has recently had to go gluten free, I truly appreciate these recipes. Thank you so much. I love this stew so much… It’s just great. Another reason to get a freezer bigger than a shoebox! My husband just made this for dinner and it was fabulous, just like everything else we’ve tried from your site. Thanks! Just made this last night, added a bit of chunked tomato I had left over, used garbonzos ’cause I was out of white beans, left out parsnip and potato and fennel (because I didn’t have them on hand) but can’t wait to make the recipe as written — and also to try some of the amazing additions left in the comments. So divinely delicious! And so very versatile! And so naturally nutritious and fabulously filling! Thank you — just found your site from googling kale and white bean soup — can’t wait to see what other savory stews and tantalizing treats await me herein! Thank you so much. I’ve been on the look out for more quinoa recipes since learning about all the health benefits but this is the first time I’ve seen quinoa used in a stew! I’m intrigued! when i was a little girl my mom moved away and I stayed with my dad. she didnt know but he was a terrible dad in many ways, one of which was in malnourishing me. when i would visit her fortnightly i would be spoiled with lovely food, puddings, dinners heaving with fresh and beautifully cooked vegetables, she was the most wonderful cook. this stew tasted like one of her autumnul roast dinners, the occasional bites of parsnip and the rich greens, the broth a light gravy. i was transported back to her kitchen when i would be happy once every 2 weeks. i would like calories/fats/fiber counts for all recipes posted. any chance of getting the nutritional value? Made this again tonight! A huge double batch. It is wonderful as always and we had a friend over that is quite nearly a full time carnivore and he LOVED it. Ate every last drop in his bowl. Thank you Isa, you truly are amazing and keep my Gluten Free, Vegan belly very well fed and happy. Yummy!!! My 4 and 7 year old daughters were delightfully surprised that they enjoyed soup with kale on it. Whenever I am bored with my current lineup of dinners, I come here. I look in my weekly veggie box, and figure out what will work. Tonight it was this, and HOLY COW is it ever fantastic!! Will be adding this to the Fall/Winter rotation for sure. Thanks! I made this 2 nights ago and it was awesome. I added some red pepper flakes to give it a little kick. I made this last night and I think it’s a really good base. I didn’t have any parnips, marjoram and fennel. Instead, I added extra carrots, italian seasoning, red bell pepper flakes and cumin. The cumin gave it a beautiful color and flavor. Turned out great! Tried this for the first time the other night. Delicious! And hearty 🙂 By any chance, has the nutritional information been worked up on this? I’d love to know. Thanks again for sharing this recipe! We LOVED it! For everyone looking for nutrition info – there are lots of websites available that allow you to enter the ingredients of a recipe and get the nutrition info. I use http://www.myfitnesspal.com/recipe/calculator but there are plenty of others if you don’t like that one. If I wan to double the recipe, do I double the spice amount? Not sure how this works. Thanks! What a great recipe, and website and general! Thanks so much for doing it! Had this soup for dinner tonight and it was great! Super yummy, and pretty too, if you use red quinoa and mini colored potatoes. (-: Thanks for posting. I didn’t have fennel or marjoram, so I used an Italian seasoning instead (which included thyme, rosemary and marjoram in addition to basil and orgeano). I wasn’t sure how this would come out, but went with all the positive reviews and have to agree, it is FABULOUS! I think it’s fine on it’s own, but it seemed to be missing something (maybe it was that fennel) so I added some red pepper while cooking it and sriracha when I was eating it, and I just love it. 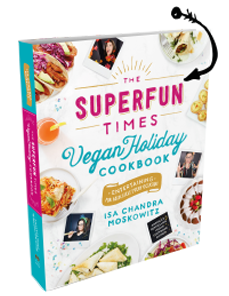 I’m not vegan (or even a vegetarian, though I’m trying to eat less and less meat), but I have vegan friends and I will make this for them, and I’ll even make it again for myself. Wonderful on a cold day!! Hi Isa! Do you think sweet potato could be used as a substitute for the yukon gold or would it throw off the flavor too much? A new favorite/go-to! Thank you, Isa! We’re not big on “spices” so I just added a pinch of thyme, and a pinch of salt, no pepper. The other big and successful change: we used hulled barley instead of quinoa — fantastic! I made this for lunch – omitting the fennel and marjoram for lack of – and it is DELICIOUS. I halved the recipe, adding more kale than it called for. My 10-month old daughter loved it (I pulse pureed her portion). Yum, what can I serve this with at a dinner party so that I’m not just serving stew? Is there any chance that the book includes nutrition content? I have a pancreas issue and tracking fat grams for the day is a must. Your recipes looks so flavorful! I so hope to purchase the book! Thanks! ISA, you are the bomb! I love your recipe and your quirky look ! If I met you, we would become best friends. Keep cooking my friend, you rock! but it provides fewer alternatives than the software.